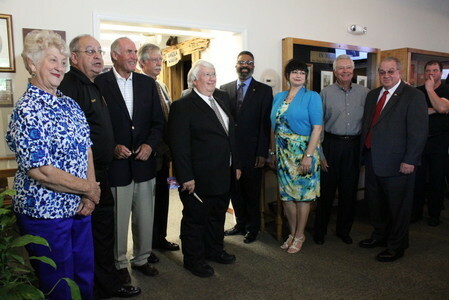 On Friday, July 12, 2013, Calcasieu Parish District Attorney John DeRosier was inducted into the Louisiana Justice Hall of Fame in Baton Rouge. DeRosier was one of seven inductees for 2013. DeRosier took the oath of office as District Attorney for Calcasieu Parish on December 20, 2005 and was re-elected to an additional six-year term in 2008. While in office, DeRosier has established the Case Review Team to improve communications with law enforcement and created the Calcasieu Full Force group to target DWI offenders. He has been pro-active and implemented an aggressive campaign to capture and prosecute online sexual predators. He re-established the Sexual Assault Nurse Examiner Program, assisted in the formation of Adult Drug and DWI Courts, and established the “Fatal Vision” DWI Simulation Program that travels to schools to demonstrate the effects of impaired driving. DeRosier also worked with legislators to pass numerous items of legislation in both the Louisiana and Texas legislatures relative to the regulation of pain management clinics and the legal distribution of controlled dangerous substances. Prior to this time, Texas had no statues to regulate the ownership, management and operation of pain management clinics within its borders.